Participation in the Eucharist, the communion of the body and blood of Christ is the most awesome of mysteries: it is sharing in the divine-human life of Christ Himself. As St. Nicholas Cabasilas exclaims "O how great are the Mysteries! What a thing it is for Christ's mind to be mingled with ours, our will to be blended with His, our body with His body, and our blood with His blood!" (See Life in Christ). For this reason, Holy Communion should always be approached with proper preparation. Two false assumptions need to be addressed in this regard. The first is that one should not partake regularly of the Eucharist because one is not worthy; once or twice a year is sufficient. In fact, this reasoning is faulty, since one is never worthy to receive Holy Communion; this is precisely why they are called the divine gifts. On the other hand, another false assumption is that participation in Holy Communion requires little or no preparation at all. As the above prayer indicates, the Holy Mysteries must be approached with proper respect and preparation, which includes not only self-preparation through prayer, fasting, and spiritual disciplines, but also reconciliation with the believing community, one's brothers and sisters in Christ. arrive on time for the Divine Liturgy (at the latest, before the reading of the Gospel). 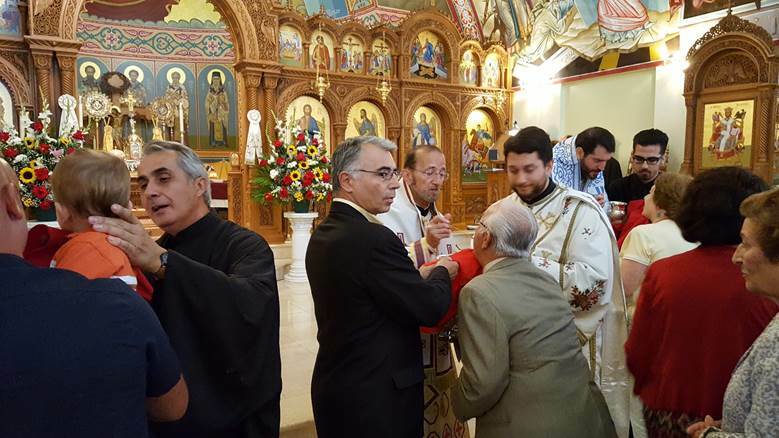 In Orthodox theological perspective, participation in Holy Communion is an all-embracing event, presupposing full communion in doctrine and practice. For this reason, Orthodox Christians are not permitted to receive Communion in any Protestant or Roman Catholic Church. Likewise, Protestants and Roman Catholics are not permitted to receive Holy Communion in the Orthodox Church. When you bring visitors to the Church Services, please be sure they are aware of this practice of our Church. Only when all the churches become fully united in faith and practice will we be able to receive Holy Communion from a common chalice. To receive Communion the usual two or three times a year is good and helpful, but to receive Communion more frequently is far better. Remember, the nearer a person comes to the light, the more light he gets. The closer he draws to the fire, the warmer he is. The nearer he approaches sanctity, the more saintly he becomes. In the same way, the more often one draws near to God in Communion, the more one receives light and warmth and holiness. My friend, if you are worthy to make your Communion two or three times a year, you are worthy of making it more often, as St. John Chrysostom tells us, by maintaining your own earlier preparation and worthiness. But what does stop us from taking Communion? The answer is our carelessness and laziness, and we give way to these faults so much that we are not sufficiently prepared to be able to receive Communion. There is another way of looking at this problem, too. People like this do not, in fact, obey God's commandment as they imagine they do. Where did God, or any one of the saints for that matter, bid us communicate two or three times a year? Nowhere is this found. Therefore we must be very sure that, when we obey a command, it is our duty to see that we are obeying it exactly as it says. That is, we must pay attention to the place, the time, the purpose, the method and all the conditions in which it should take place. Thus the good action that we wanted to perform will be perfect in every detail and well pleasing to God. You can see that the same thing applies to the case of Holy Communion. It is both necessary and very beneficial to the soul for a person to receive Communion frequently. It is also in obedience to the commandment of God. It is a good deed well done and well-pleasing to God. On the other hand to communicate only three times a year is neither in obedience to a command nor a perfect good deed. Because it is not good in itself, its results are not good. Therefore, like all the rest of God's commandments, every one requires the right time, as it says in the Book of Ecclesiastes, "For everything there is a season." This is true also with regard to the command about Holy Communion. We must receive the proper time; and that means the proper time is the moment when the priest exclaims, "In the fear of God and with faith and love draw near." Is this heard only three times a year? Oh, no. Yet, although everyone must eat two or even three times a day in order that the material body may live, must the unfortunate soul only eat three times a year - or perhaps even once-the food that gives it life in order to live the spiritual life? And isn't this completely absurd? Even if this is not the case, I am very much afraid that we may be deriving no benefit from complying with the commandments, because we water them down and spoil them. So we are not keepers of the law, but breakers of the law. "I believe, Lord and I confess that You are truly the Christ, Son of the living God, who came into the world to save sinners, of whom I am the greatest. Moreover, I believe that this is in truth Your sacred Body and that this is in truth Your precious Blood. Therefore, I beseech You, have mercy on me and forgive me my offenses, both voluntary and involuntary, whether in word or deed, willing or unwilling; and render me worthy to partake of Your sacred mysteries without condemnation, for remission of sins and everlasting life. Amen. "Son of God, receives me today as a partaker of Your mystical supper; for I will not speak of the mystery to Your enemies, nor will I give You the kiss of Judas. But like the thief I will confess You. Remember me, Lord, in Your kingdom." "We thank You, loving Master, benefactor of our souls, that again today You have counted us worthy of Your heavenly and immortal Mysteries. Set us a straight path; make us all firm in reverence of You; keep watch over our lives; safeguard our movements; through the prayers and intercession of the glorious Theotokos and ever-virgin, Mary and of all Your saints. Amen."